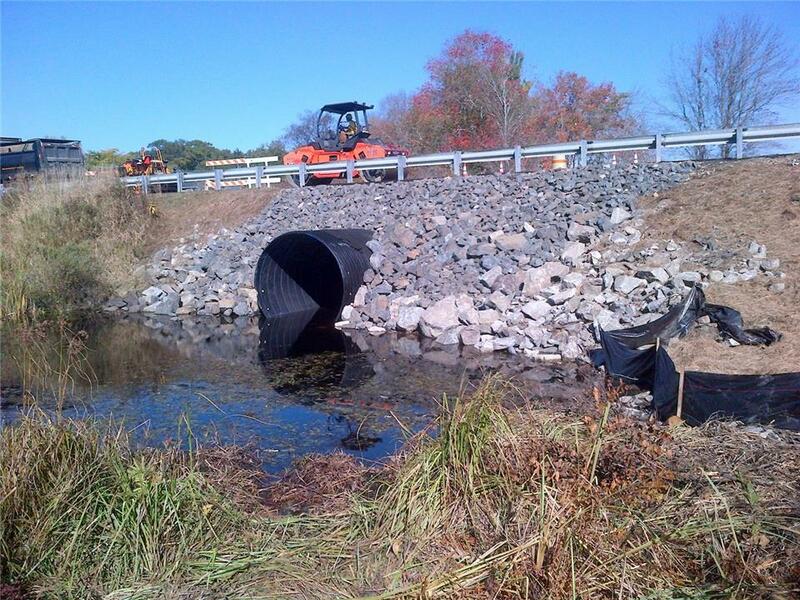 During a general inspection in the Town of Warren located in Knox County, the Maine Department of Transportation (MEDOT) determined that a large culvert under U.S. Route 1 was in need of replacement. The culvert upgrade would take place in a difficult tidal bog under a busy highway. In the state letting, the MEDOT specified that the pipe be either a 96" diameter steel reinforced polyethylene (SRPE) pipe or a profile wall HDPE. Prock Marine, Rockland, ME was awarded the project and was looking for a product that provided not only a competitive price with a shorter lead time but was lightweight. After looking at these two options, they selected Contech Engineered Solutions' DuroMaxx® SRPE to replace approximately half of the existing culvert structure that ran directly under the highway. Due to the custom longer length availability, Prock Marine was able to directly bury the entire, single 42’ length section that was factory-joined by a welded coupler (WC) to provide a watertight joint capable of up to 30 psi. 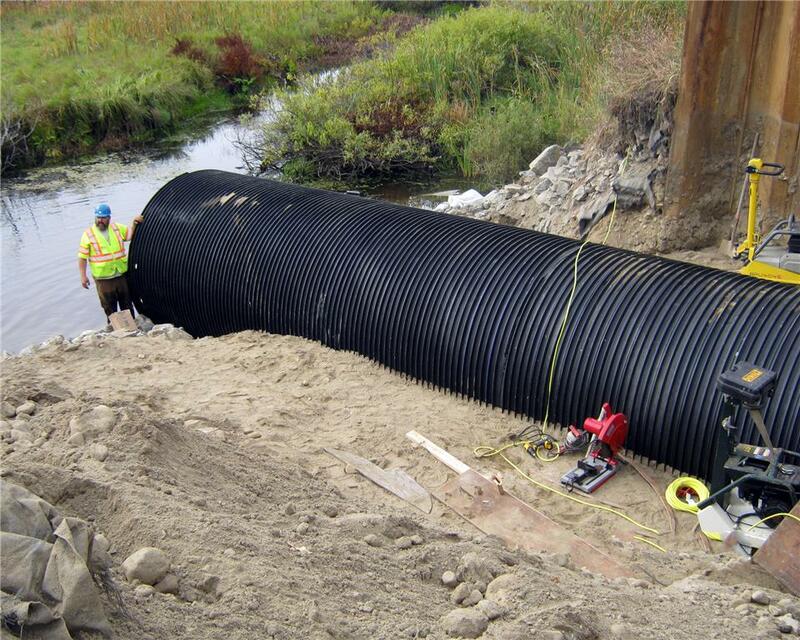 With the smooth interior surface of the 96” diameter DuroMaxx pipe and its unique profile, the hydraulics engineer was also able to exceed the current hydraulic capacity of the existing culvert with a compact wall resulting in just a 97.8" outside diameter. The result was a rapid installation of a high performance culvert pipe that can accommodate 2.0’ - 30’ of earth cover in this aggressive tidal flow environment. According to MEDOT's Project Resident Dean Rowlands, "As a DOT with a massive coastline, it is nice to have an option where we can incorporate an economical large diameter reinforced plastic culvert solution for our salt and brackish water installations where RCP or CMP may not be the best option." Steve Wolf, P.E., Contech's Northern New England Manager, had this to say, "DuroMaxx is a game changer in the large diameter culvert and storm sewer, sanitary sewer, industrial storage and slipline markets where a watertight reinforced plastic option is preferred. With its Compact wall, light weight and ability to handle both low covers with highway loads & high fills, DuroMaxx is an extremely cost-effective option versus the more traditional fiberglass, profile wall polyethylene or RCP options in diameters of 72" and greater. 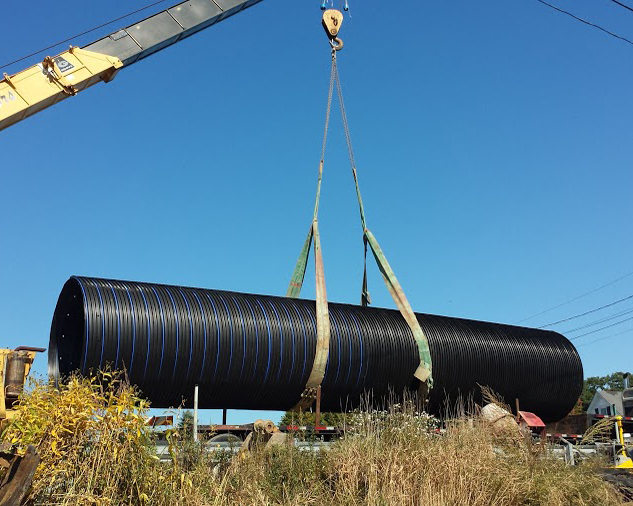 Weighing just 87 lbs per LF, 96” DuroMaxx negated the need for a crane or large excavator to unload and place this culvert versus a similar 96" Reinforced Concrete Pipe option that would weigh 3,100 lbs per LF."